Are you licensed and if so where? 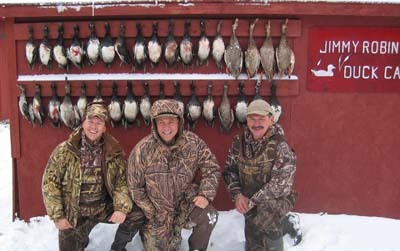 The lodge is a member of Manitoba Outfitters Assn. Guides are all required to have a Manitoba guide license. What are the rates? Rates are $1,300 per hunter for a three day hunt. License is $175 Canadian. Do you offer any guarantees? We guarantee lodging. Deposit refund if cancelled by August 1st. What services do you provide? We provide food, lodging, guides, bird cleaning. How long have you been a licensed operator? Lodge has been operating since the 1930's. Current owner since 1984. Can you provide references? Yes. Our regulars include several wildlife artists, DU officers including the President and the Chairman of the Board. Can I bring my own dog? Dogs are welcome. Chain link kennels with concrete runs are available. Well behaved dogs are allowed on the hunts, and in the lodge. What equipment/boats do you provide and please describe? Boats, decoys, transportation to the marsh, trucks, atv's. Please describe your accommodations. Accommodations are excellent. Not a roughing it set up. What is your cancellation policy? Cancellation is by August 1st for full refund of deposit. How many hunters can you accommodate at one time? We can accommodate up to 16. We limit to 12. Most hunts are less than that.